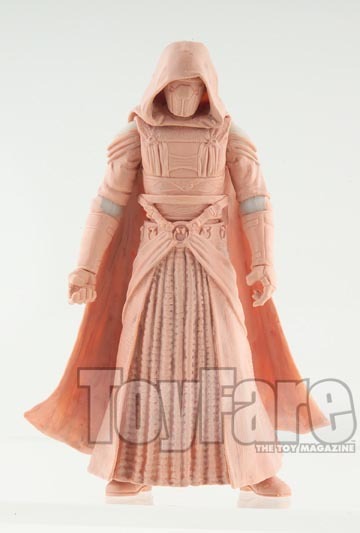 So, on that otheR Site they've got pics of the Revan sculpt from a recent Toyfare. If you dont remember, this is the KOTOR Sith Lord that won the Fan's Choice. It looks like a decent sculpt to me. Detailed, arm articulation in the pic is all I can see and it looks good. Your thoughts? I love it! I'm actually playing the game again for the third time, and so far this figure looks excellent! The figure itself doesn't look too bad, but I guess I'm just not overly excited for it personally since I'm not familiar with the character (or game). Great for those who voted for this figure though. Exactly my position as well. I am all over this figure! Sorry to those of you that aren't interested in it/don't like it. To me, the more bad guys the better, EU or not! But here's to hoping that Hasbro goes the extra mile on this and does the coloring appropriately as well. I'd hate to see them put out a great sculpt only to have them miss the mark once it's painted. As a 30 year old fan who hates the vast majority of EU and is only a casual gamer, I can tell you that this character has a very interesting back story. Any of you who has an Xbox or PC should play this game...its more like Star Wars that the PT at times. I agree with Lando that, unless you really just don't care for EU in general, the game really does play out fantastic and you'll probably like the story... I think it's worth playing through and getting to know the character(s) in it but that's me. The figure looks fantastic I think... hasbro has a real quality looking sculpt there. When I do my reviews the sculpt is generally the first aspect of any action figure I start picking apart. Not often does Hasbro drop the ball, but it does happen on occassion. But this figure looks really to be above par in terms of little details... Kudos to them for a fine job on that. I didn't want him to win either, and having ONE KOTOR figure bugs the **** out of me... even just two would bug me. You need more to make it really count IMO, but at least what they are offering is looking like a good toy anyway. Suspended animation will solve all your continuity problems, my friend! He'll look great on my Sith Lords shelf. I think the KOTOR lineup would have been a much better choice that the Marvel repaint catastrophe that we're getting. I've sadly never played any KOTOR but the characters look intresting (especally Hk-47 who seems funny & like Bender) I'll be picking this guy up. I haven't gotten to play the game, but Revan looks sweet! Definitely buying him! Looks pretty good, but it'll be interesting to see how articulated he is from the waist down. I'm guessing there will be little to no articulation, but whatever. articulation looks maximum on upper body. i too am a little concerned about lower body. I would have to agree with you guys. I'm not an EU hater... I just don't go too far outside of the movies. I'll be passing on him, but it means an extra one sitting on the pegs for you guys.